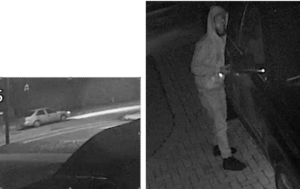 The Palm Beach County Sheriff’s Office is seeking the public’s assistance identifying a suspect WANTED for Car Creeping. This suspect is believed to have crept into numerous vehicles (possibly 6) in the City of Lake Worth. The vehicle he is pictured breaking into is on Harvard Drive, Lake Worth. The suspect is believed to be a black male, has a beard and is possibly wearing glasses. This incident occurred on February 14, 2019.